The rain never stopped on Sanderson Street. A local legend existed, but Nina never put much stock into it. It was, after all, just rumors circulated by bored neighborhood kids who had nothing better to do. And how could they? Nothing ever happened in the sleepy hideaway town that held one infuriating peculiarity—a street that claimed all the rainfall. While steam rose from the neighboring roads, Sanderson tipped toward flooding. Thank the heavens water ran over the paved brick and down to the rest of the houses. At least the kids had a way to cool off when it got too hot and their parents, collecting it by the buckets, managed to store the supply for later use. Most feared Old Man Sanderson—the only person who lived on the town’s legendary anomaly—but few actually knew what he looked like. It was rumored, along with the reason for it all, that he wasn’t even a man, but a wizard, who, too greedy to share, claimed all the town’s rainfall for himself. No one knew where the rumor originated from or if it had any truth to it, but Nina, like the rest of the townsfolk, didn’t care either way. It rained on Sanderson Street only, and that made living life in Haymitch hard. And hot. One day, right in the peak of Autumn, when a gust of wind unhinged a spiral of yellow and orange leaves, Nina’s daughter, Mary, had a thought. “What if he’s sad?” she asked her mother. Nina thought this a very odd thing to think. People rarely spoke of the man and when they did, it often resulted in curses and mumblings. Why should he claim all the water in Haymitch? It left the rest of the town responsible for stealing it to live off of and to keep their lands fertile for produce. And if he was, in fact, a wizard, he would know of such verbal exchanges, so people rarely mentioned him, let alone accused him of being sad. Mary watched her mother leave and join the hive of bodies moving around as they made their way to work. Mary enjoyed the hustle and bustle of it all and usually imagined herself one day joining in the same routine. Except this day, her thoughts fell elsewhere. She couldn’t help it. She’d always loved the fall—maybe because it came right after the hottest season which meant she had an entire year until the blistering heat returned—but Mary frowned at the thought of Old Man Sanderson never getting to enjoy it. With all the rainfall, he couldn’t possibly know what a crisp afternoon breeze felt like, or to watch twirling leaves make their escape from age-old trees. He wouldn’t understand the warmth of sun on skin or that perfect moment when all the elements of nature come together in a way that make one feel divinely happy for being alive. Everything for Old Man Sanderson stayed the same: humid and loud and wet. Nothing ever changed for him. Nothing ever got better. He probably doesn’t even know what an autumn leaf looks like, Mary thought to herself. And then an idea sparked. I’ll take him one! Under no circumstances was anyone to visit Sanderson Street, other than for the sole purpose of collecting water. A Haymitch rule as far back as anyone could remember, and Mary decided today would be the day she broke it. Her mother and father wouldn’t be home until close to sunset which gave Mary plenty of time to walk the distance toward the back side of town, chat with Old Man Sanderson for a bit, and return home before they did. She’d gather a few autumn leaves and then she’d be on her way. The only snag was an umbrella. She didn’t have one. No one did. There was no need for them so Mary knew she’d get wet. And if she came home soaking, her parents would know where she’d been. Perhaps I can borrow one from Old Man Sanderson, she thought to herself. And if not, the autumn sun is sure to dry me up on the walk home. Mary left the house. After collecting a handful of the best-looking leaves, she turned up the street and headed for the backside of town. Fear crept over her only once but she swatted it back with sympathy for the old man. He was, after all, sitting all alone in that house somewhere. He needed a friend; he needed someone to keep him company from time to time and that’s what Mary was doing. It took her less time than she thought to reach Sanderson Street, and when she did, she paused at the start of the wet paved brick. It wasn’t raining—it was storming. Water gushed down from the sky’s black ceiling in sheets, making it difficult to see feet in front of her. But Mary came this far. There was no turning around now. She tucked the leaves beneath her blue sweater and made a run for it. It wouldn’t be difficult to find—his house was the only one on the street. She’d barely dashed into the pouring rain when she saw the structure ahead. Large and dark, it stood like a monstrous silhouette behind the curtain of water. And in it somewhere, Old Man Sanderson moved about. Mary jumped onto the covered porch and out of the rain. She wiped her face with her damp sleeve and shifted the sweater slightly, the leaves crunching over her belly. She knocked twice and waited. When nothing happened, she knocked again. Maybe he couldn’t hear her over all the rain? Mary waited another minute before trying again and then finally she wondered if perhaps the man was deaf. Or maybe he was in the back part of the house where he couldn’t hear her? Maybe she should circle the property and try knocking on a different door? Just as she was about to set out, the large steel door swung back. It took Mary a moment to respond; she was too busy taking in the sight of the lean old man she’d only heard rumors about. He was impressively tall, but that was an understatement. Mary was short for being only nine years old, but even at her height, she knew Old Man Sanderson was closer to a giant than a man, and had a long grey beard that reached his belt. Perhaps he was a wizard. But where was his cloak? And his hat? He must’ve kept them inside. Mary gulped and scanned his rather normal attire. Blue jeans with a red and orange plaid shirt. What a strange wizard. “Splendid,” she moved past him without waiting for an invitation. Mary scanned the house’s interior. Strange, she thought, it looks just like a normal house. She wasn’t sure what she expected to find, but this certainly wasn’t it. She’d hoped for gargoyles or goblins statues but found mundane carpets and end tables instead. A low fire kept the main room warm and Mary gravitated to it like a moth. She was used to the heat, but being soaked was a first for her and she gladly soaked up the fire’s warmth. Once she felt dry enough, she turned around and found Old Man Sanderson watching her from the entryway with a quizzical frown. Disbelief colored his tone before he hid it with a scowl. “I’ll get your apple juice,” the old man muttered to himself as he headed for the kitchen. Mary helped herself to a seat and waited for his return. It really was an old place for a wizard to live—there seemed nothing extraordinary about it at all. No spell-books, no cauldrons or brooms—but that’d be for witches, wouldn’t it? Mary didn’t know. Information on the subject was limited and it wasn’t like anyone else came over here to investigate such matters. The responsibility now fell to Mary and she was determined to learn as much as possible. Old Man Sanderson returned with a plastic cup filled with a reddish-brown liquid. He handed it off to his guest and sat in the velvet recliner opposite her. This was a new concept to Mary; Old Man Sanderson existing somewhere outside his house? No one ever contemplated that. No one ever thought of him being somewhere else, doing something else. He was always the old wizard that stole everyone’s rain. Old Man Sanderson watched Mary with a quizzical expression, like he was trying to figure her out. She’d been the first person to knock on his door in, well, ages. The last little brats that came by only did so as a prank, and he made sure no one else tried to do that ever again. He’d hoped they were the last of his unannounced guests and was shocked to hear Mary’s arrival on his front porch. “Like this,” he waved his hand and her cup filled with more apple juice. The wizard shrugged and focused on the fire. “And where’s that?” she sat down, curious this time. Mary didn’t know what to think about that, much less what to say. Surely the loony old man must be certifiable. A certifiable crazy old wizard. That’s what he was. And she was wrong to have come here. It grew quiet then, the flickering fire the only sound in the room. Except for the rain. That never stopped. And the hard pelts hitting the tin roof and the brick pavement outside became a sort of sad lullaby to Mary. She frowned at her host, at everything she’d asked of him and everything he told her in return. 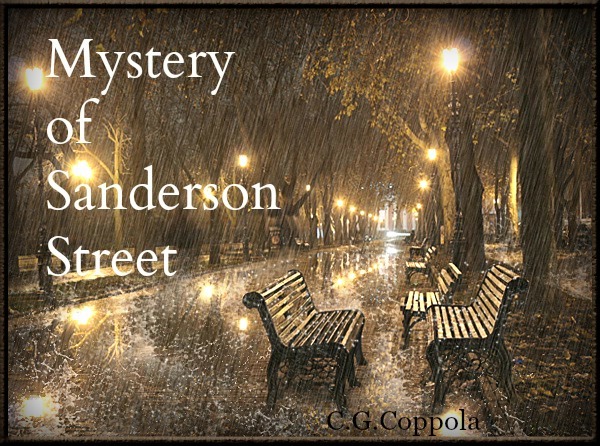 They’d only barely skimmed the surface to the mystery of Sanderson Street—and especially, of her mother’s part in it—but Mary sensed their time was coming to a close. Mary had no idea. In fact, she had no recollection of anything except wanting to know about Old Man Sanderson. She thought she remembered walking to his house, but that was more of a blur. And the man—he was certainly tall—barked at her to go. Mary took the hint. She raced out of the house and into the rain for the last time, running back to the front part of her hometown. The hurt swelled inside him, mostly because of who she was running home to. Nina. The girl from the ocean. The mermaid he’d never stopped loving. Maybe he should’ve left her in the blue realm where he first met her all those years ago. New to his powers, he’d only just discovered the secret door in the attic of his grandfather’s house. And the magical places it would take him. But he didn’t know how to handle the other stuff—the politics of a world that was cruel to its princess and what it would eventually mean to give into her one dire request. Thomas stood at the window and peered out through the pouring rain. Did I make the right choice, Nina? Are you happier now? Only the flickering fire answered. And Thomas was alone again.